Bee venom? On your face!? Yes. Sounds crazy, right? I thought so too. But when the lovely folks at Abeeco approached me to try their product, I obviously was into it. If this gets rid of wrinkles like Botox, sign me the f up. Amiright? First take, I loved the ingredient list. I could actually read it, guys. It says to test a small patch before you go ahead and slather it on. So I did that. It is worth noting here that if you are allergic to bees, you clearly shouldn’t use this product. After I determined that I wouldn’t have to use my epi-pen, I proceeded to slather this over my face. The first time I used it, I did so as a mask: massaging gently, apply a generous layer to your face and neck twice daily and leave for 20 minutes. Wash off. I noticed that my skin was super moisturized (huge plus during the winter), wasn’t greasy (another huge win) and it seemed more plump. The next use was as a moisturizer. I really, really like this mask as an addition to my skin-care routine. It’s really moisturizing and oddly is super matte, which is great because nothing is worse than your skin being an oil-slick. That is not cute. I’m intrigued! Okay, so I have to ask… does it sting* at all? Would it be okay for sensitive skin? Sounds amazing! 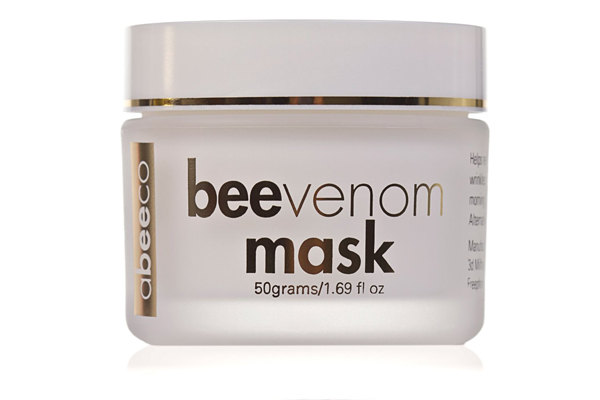 Can’t say I’ve thought about using bee venom, but considering how much I depend on bee products (or at least, honey…) – I’m not opposed!